Posted on August 1, 2016 by Social NetworX Inc.. Warm weather, world class golf courses and first-rate restaurants. This is Palm Springs, one of the most attractive places to live in America and now it can all be yours. Located in the exclusive Canyon Sands community rests an amazing property you have to check out. This two bedroom, two bathroom home radiates style and sophistication making it the most attractive properties on the market. The home has recently been updated and features a new kitchen with stainless steel appliances, quartz countertops, recessed and pendant lighting and rich cabinetry. The elegant design in the bathrooms includes new tiles throughout, new vanities and recessed lighting. The large two car, attached garage offers direct access to the home giving you peace of mind and the private patio features new desert landscaping creating the perfect atmosphere for resting and relaxing. 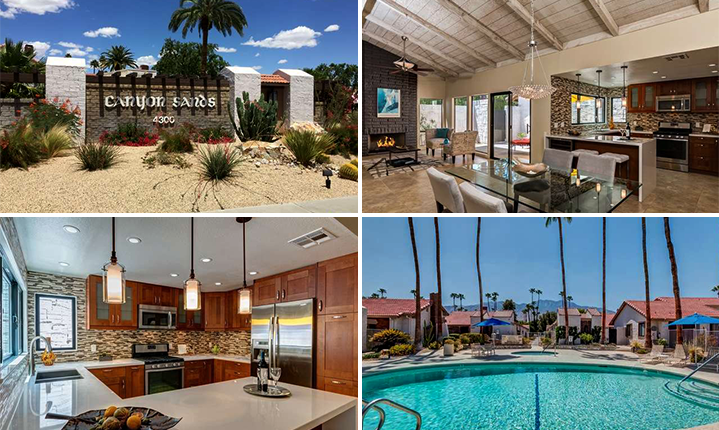 Canyon sands is located in the desirable south end of Palm Springs and includes 7 pools, 7 spas, and a lighted tennis courts. Minutes away are shops, restaurants, hiking trails and, of course, world famous golf. At 307K, this home is priced to sell and won’t last long. To schedule a private viewing, call me – Randy Wiemer – today at 760-333-7747! This amazing property does not disappoint.